I was watching an episode of Destination Truth last night and they covered this haunted island full of super creepy dolls. I know I have talked about Robert, the Haunted Doll in the past, but this episode got me thinking about dolls and their penchant for getting all hauntified. The island from Destination Truth was in Mexico, and the story went that a young girl had drowned there, and people began leaving dolls to comfort her. Of course, these dolls are now all battered and decapitated, leading to a spectacular vision of “Yikes.” The “Truth” team did experience some possible paranormal experiences there, including a doll opening her eye. Follow this link to watch the episode about the Haunted Isle of the Dolls. Robert the Haunted Doll is a creepy tale of a man and his personal doll fixation, blending a traditional haunting with tales of voodoo, and is covered ad nauseam on the internet. 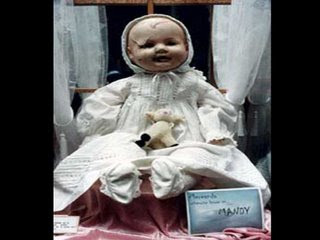 Mandy, the haunted doll, however, may be a new story for you. Mandy is a 100 year old doll that was donated to the Quesnel Museum in British Columbia. A typical tattered doll, the woman who donated her told the museum curator that she was often awoken at night to the sounds of a baby crying. She had no baby, and tracked the sound to the room the doll was in. The noise stopped once she got rid of the doll. Museum staff have claimed that since the dolls arrival poltergeist type activity has occurred including objects being moved, as well as electronic disturbances, like people’s camera batteries draining. Some even claim that the doll moves and changes positions. No reason for this dolls haunting has been discovered, so is it just the “old doll creepy factor” or is it the spirit of a past owner come to play with the living? 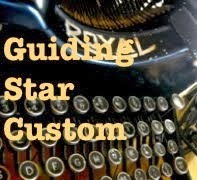 Do you have a creepy haunted doll story? Share it here! It is a very nice show, it was one of my favorites. I personally think that people are just paranoid because they see too much haunted creepy dolls on TV and in the movies. As far as I know, spirits have good intentions. And the only reason why they're "stuck" on Earth is that either they're here to help (like they're on a mission) or they need help to move on. Has the museum tried to ask help for psychics to figure out the reason for the doll's haunting? Creepy. To think that doll would be possessed by invisible entities is spine tingling. I didn't really liked dolls when I was kid, it gives me the creeps and I think this would affirm it. This past August I was able to see Mandy in the Quesnel Museum. I have never been so unnerved by a doll in all my life. I quickly took a picture with my phone then left. I felt anxious and scared when looking at the doll. I went in there a non believer thinking that it was all just hype but being there in person and seeing the doll I now believe. would love to see that pic!